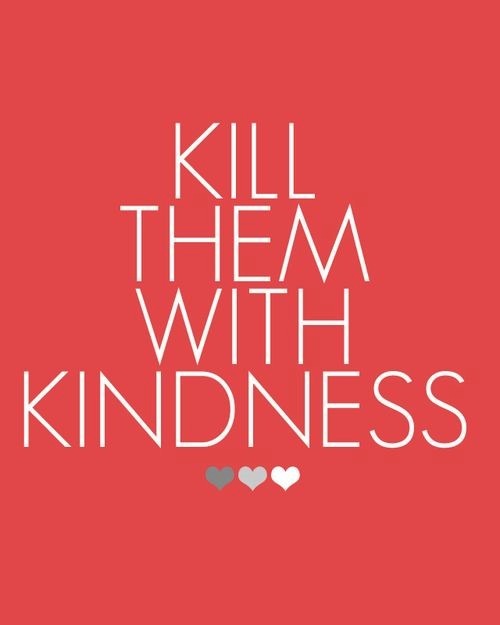 way, way back when, my mom would overuse the phrase," kill them with kindness." when i would complain about the littlest of things... classmates who were mean on the playground in elementary school, to girls who were trying to steal my boyfriend in high school... after every vent session, i would get lectured on kindness. i was told to never stoop down to anyone else's level, no matter HOW hurt you may feel. and i never truly understood or processed what she was saying, but would give her a quick eye roll and shrug, typical teenager, right? now that i have grown up and learned much more about my own identity, this phrase is something that has been rather ingrained in me. i specifically realized this last night during a powerful church service at mosaic. the topic was on friendship. some may say i need to start standing up for myself more or maybe i need to have more of a backbone when it comes to conflict, but i think it is much easier to just be kind. if you are confident in who you are and what you stand for, the important people will stick with ya. you will be like a magnet to people you want to have in your life. and the others don't even matter.